Over the past couple of weeks I have joined a variety of new services including App.net, State, Branch, Medium, Kippt, Buffer. I recently backed my first kickstarter-ish project ever and decided to join App.net (AppDotNet or ADN). People keep asking me if I think it can ever compete with Twitter or will it ever reach critical mass or if it will stay a ghost town like Google+? For me the question is not whether ADN will be able to “replace” Twitter but rather I see it as a reflection of the current zeitgeist. ADN is not simply an ad-free alternative to Twitter. Instead, alternatives to major platforms such as Facebook and Twitter are increasingly gaining momentum. ADN is definitely not the first, think for example of Diaspora (launched as a Facebook alternative) and Identi.ca (formerly Status.Net) which calls itself “a stream oriented social network service” (FAQ). Both services never really went mainstream, maybe because they were both ahead of their time. ADN, at a first glance, seems similar to Identi.ca but there is one important distinction which also differentiates it from Twitter because with Identi.ca “You can install the StatusNet software that runs Identi.ca on your own servers, since it’s Free and Open Source software. You can make groups, and share privately with those groups.” This allows you to run Identi.ca on your own server, a decentralized model, while both Twitter and ADN rely on a centralized model. ADN follows a centralized model which is very common for the current era of social media platforms. As a platform, ADN is operating as software as service, “a software delivery model in which software and associated data are centrally hosted on the cloud,” and offers an API for developers. The API is the main core of ADN and alpha.app.net is only one possible way of how an ADN application or service can look or function. Two great write-ups deal with these issues: First, Dan Wineman describes the relation between the social graph, publishing and aggregation and how social platforms like Twitter and ADN deal with these differently, and second, Orian Marx describes what ADN is, could possibly be and how it is different from its alternatives. Yes, ADN costs 50 dollars (or 100 if you are a developer) and it is still a centralized service but I can’t even begin to describe what has been developed with the ADN API in less than three weeks. My username is @silvertje if you would like to contact me on ADN. 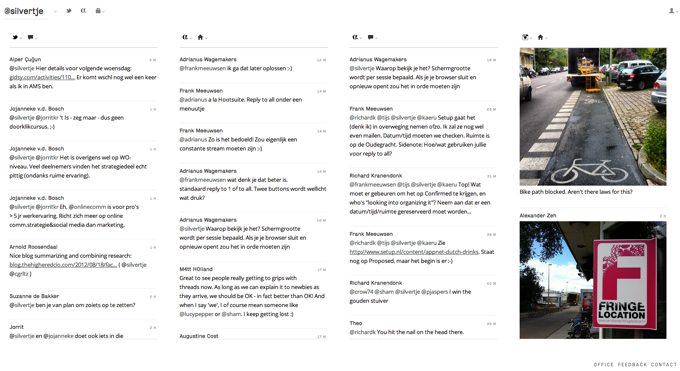 I have created a Google Doc which lists about 80 other Dutch ADN users, @adrianus has built Appnetizens streams, a “Tweedeck” like interface for ADN (for which I did some CSS-color-advice) with multiple column-view and tons of other features such as a “Netherlands” view with all known Dutch users, @frankmeeuwsen has started a blog titled Appdotnet Culture which documents ADN’s early developer and user culture and @richardk writes about ADN developments. I’ve also created an IFTTT recipe that allows you to cross-post selectively from Twitter to ADN whenever the tweet contains the hashtag #adn. I started using Buffer to cross-post some messages from Twitter to ADN using an IFTTT recipe I created: Send Tweets with Hashtag #ADN to App.net via Buffer However, IFTTT just added ADN as a channel to their service so I don’t have to pipe everything through Buffer anymore, so until I find another use for this service I am putting it on pause. Update: Joshua from State kindly answered my question concerning the RSS feature. State is currently using “Google’s Feed API (https://developers.google.com/feed/) to search for feeds using the text you type into the box” which interestingly enough brings up the feeds for my presence elsewhere but not my own blog. Branch, Medium, Kippt are three more new platforms I joined recently for publishing, discussing and link sharing but so far I have merely glanced at them, as one can only spend so much time online. On a final note, I’m happy to contribute as a female to the all these new services which are dominated by “alpha geeks” aka white males according to BuzzFeed’s latest article on the early adopters of these platforms. Nice and helpful read. Going to try State, because I loved Netvibes, but somehow grew out of fashion (for me). Never had a good alternative. Maybe State does the new stream/cloud job…? Would love to read your opinion on Branch, Medium and Kippt, though… Bring it on! You’re welcome, and thanks! Yes, I’ll definitely write about the other three once I get a chance to try them out. I can definitely recommend signing up for a State invite, it’s very clean and basic but doing a powerful and great job. Thank you, Anne, for a very useful overview of future platforms. Another way to look at is is from a technical point of view: the TENT initiative is a new protocol on which others can build (decentralized) services. This way users can own their data, etc etc. 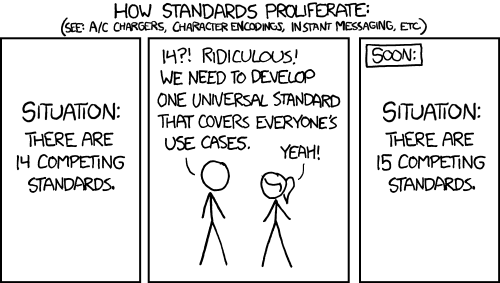 I can imagine access providers offering a TENT account next to the existing POP, http, news etc. accounts. BTW I don’t have the skills to see which protocol is the most promising. TENT just one example, but there are more in the works. Absolutely. Great addition. While ADN (AppDotNet) offers an open API on top of their platform, Tent offers a protocol which operates on a different level.